Fahimi, S., Naseri, M. (2015). Anti-halitosis plants in Iranian Traditional Medicine. Research Journal of Pharmacognosy, 2(2), 61-66. Sh. Fahimi; M. Naseri. "Anti-halitosis plants in Iranian Traditional Medicine". Research Journal of Pharmacognosy, 2, 2, 2015, 61-66. Fahimi, S., Naseri, M. (2015). 'Anti-halitosis plants in Iranian Traditional Medicine', Research Journal of Pharmacognosy, 2(2), pp. 61-66. Fahimi, S., Naseri, M. Anti-halitosis plants in Iranian Traditional Medicine. 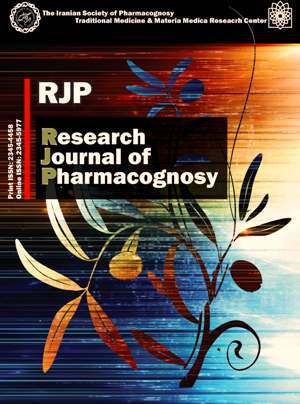 Research Journal of Pharmacognosy, 2015; 2(2): 61-66. 2Iranian Traditional Medicine Clinical Trial Research Center, Shahed University, Tehran, Iran. Halitosis is an oral health condition characterized by unpleasant odors emanating constantly from oral cavity. Almost 22-50% of the population experiences such a condition during lifespan and about half of them suffer from personal discomfort and social embarrassment. Based on the literature survey, it seems that the oral cavity is the most important origin of halitosis; therefore, this area could be considered as the best target for the treatment. Halitosis is a well-known disorder in Iranian Traditional Medicine (ITM); Avicenna and some other famous Iranian traditional physicians have described this condition in their manuscripts precisely. Herbal therapy was the major treatment suggested by Iranian scholars in which mixtures of medicinal plants were used in the form of mouthwashes and other oral formulations. In the present study, six Iranian ancient medical texts were screened for the herbs with anti-halitosis effects. Subsequent to this study, the medicinal herbs were listed and scored based on the frequency of their repetition. Moreover, the effort has been taken to provide the best scientific name for each plant as well as searching modern studies about their biological effects. In our investigation fourteen plants were obtained as the most frequent herbs for treatment of halitosis in ITM. Previous studies revealed that some of these plants have shown biological activities relating to anti-halitosis effect. The present study introduces some more plants for future studies about anti-halitosis property. Van den Broek A, Feenstra L, De Baat C. A review of the current literature on management of halitosis. Oral Dis. 2008; 14(1): 30-39. Cortelli JR, Barbosa MDS, Westphal MA. Halitosis: a review of associated factors and therapeutic approach. Braz Oral Res. 2008; 22: 44-54. Porter S, Scully C. Oral malodour (halitosis). BMJ. 2006; 333(7569): 632-635. Lourith N, Kanlayavattanakul M. Review article: Oral malodour and active ingredients for treatment. Int J Cosmetic Sci. 2010; 32(5): 321-329. Arzani MA. Tibb-e-Akbari. Tehran: Iran University of Medical Sciences, Research Institute for Islamic and Complementary Medicine, 2008. Aghili Shirazi MH. Moalejat-e-Aghili. Tehran: Iran University of Medical Sciences, Research Institute for Islamic and Complementary Medicine; 2008. Rhazes Al Havi. 1st ed. Afsharypuor S, (Trans.). Tehran: Academy of Medical Sciences, 2005. Heravi M. Al-abniah An Haghayegh el-adviah. 1st ed. Tehran: Tehran University of Medical Sciences, 1967. Tonekaboni M. Tohfat-ul-momenin. 1st ed. Tehran: Traditional Medicine and Materia Medica Research Center, Shahid Beheshti University of Medical Sciences & Nashre shahr Press, 2007. Soltani A. Encyclopedia of traditional medicine, medicinal plants. 1st ed. Tehran: Iran University of Medical Sciences and Health Services, Institute of Medical History, Islamic and Complementary Medicine Research, Medicinal Plants Group , 2004. Amin Gh. The most common medicinal plants of Iran. 1st ed. Tehran: Tehran University of Medical Sciences, 2005. Ghahraman A, Okhovvat AR. Matching the old medicinal plant names with scientific terminology. 1st ed. Tehran: Tehran University of Medical Sciences, 2004. Rossi AD, Ferreira DCA, Silva RABd, Queiroz AMd, Silva LABd, Nelson-Filho P. Antimicrobial activity of toothpastes containing natural extracts, chlorhexidine or triclosan. Braz Dent J. 2014; (3): 186-190. Almekhlafi S, Thabit AA, Alwossabi AM, Awadth N, Thabet AA, Algaadari Z. Antimicrobial activity of Yemeni myrrh mouthwash. J Chem Pharm Res. 2014; 6(5): 1006-1013. Henley-Smith C, Botha F, Lall N. The use of plants against oral pathogens. Microbial pathogens and strategies for combating them: science, technology and education.4th ed. Badajoz: Formatex Research Center, 2013. Kim JS, Park JW, Yoon SW, Ryu BH. Inhibitory Effect of respective herbs in Cheonggugamrosu on oral malodor using malodor modeling of the salivary sediment system. J Korean Orient Med. 2009; 30(2): 79-87. Kumar P, Ansari SH, Ali J. Herbal remedies for the treatment of periodontal disease-a patent review. Recent Pat Drug Deliv Formul. 2009; 3(3): 221-228. Cherian E, Mathew J. Bacterial sensitivity to organic herbal extracts. Baselius Research. 2010; 11(2): 139-145. Rosas-Piñón Y, Mejía A, Díaz-Ruiz G, Aguilar MI, Sánchez-Nieto S, Rivero-Cruz JF. Ethnobotanical survey and antibacterial activity of plants used in the Altiplane region of Mexico for the treatment of oral cavity infections. J Ethnopharmacol. 2012; 141(3): 860-865. Forsler M, Sert YS. Functional ingredients for oral health in LEAF products. M.Sc. thesis. Department of Food Technology, Engineering and Nutrition, Lund University, Lund, Sweden, 2011. Ramji N, Ramji N, Iyer R, Chandrasekaran S. Phenolic antibacterials from Piper betle in the prevention of halitosis. J Ethnopharmacol. 2002; 83(1): 149-152.